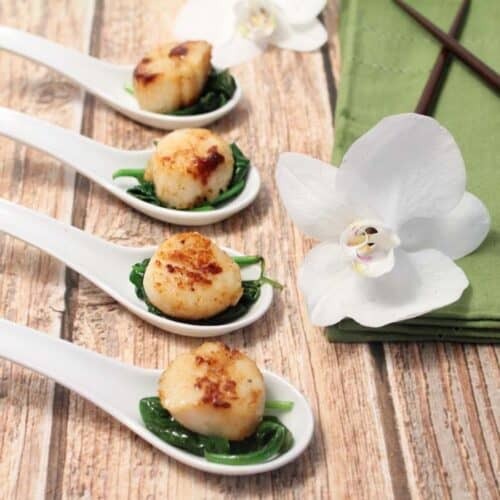 If you love scallops and easy dinners then this Sea Scallops over Spinach recipe is for you! It takes less than 20 minutes and it's made all in one pan Just sear the scallops, cook the spinach with garlic til it wilts then set the scallops on top & you've got a gourmet dinner in minutes! If there is only a little liquid left in the skillet add the additional 1 teaspoon of olive oil. Add onion and garlic and saute for about 2 minutes, stirring frequently. Add spinach, it will overflow pan but will quickly reduce in size, and toss lightly until spinach is wilted. Salt & pepper to taste. Place spinach on serving plate and top with scallops.